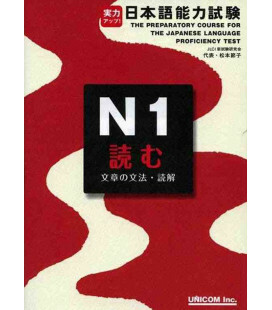 The Preparatory Course for the JLPT N5, Yomu: Learn Kanji, Vocabulary, Grammar. This book has been written as a study guide for the Japanese Language Proficiency Test (JLPT), Level 5. The content includes characters (Kanji), words, grammar, important forms of speech, and conversational expressions. Apart from reading comprehension, all the material tested by JLPT N5 is covered. 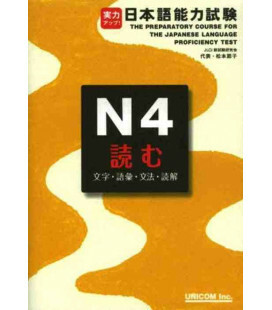 Study kanji that will appear in the Level N5 test. You will need to know about 100 characters, witch is not that many. Have fun while learning answering the practice problems. The words that appear in Level N5 are classified by situation topic. Please use the practice problems to check your vocabulary. You can use the marker to highlight words you don't know. All important basic level grammar is covered. In addition to Japanese explanations and model sentences, English translations are provided for reference. Read the verb and adjective forms out loud so that you remember them as well as understand them. This chapter includes sentences patterns, adverbs, conjunctions, and other important forms of speech, using words that often appear in the test. Using model sentences is a good way to study this material. Choose one that you like and read it out loud. Level N5 does not only test grammar and vocabulary but also expressions commonly used in conversation. In addition to preparing for the test you will learn everyday conversation.